Global warming has not caused an increase in the frequency or intensity of hurricanes, a study published by the Global Warming Policy Foundation has confirmed. 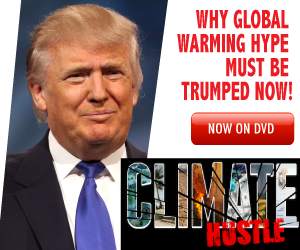 Climate alarmists such Michael Mann, Kerry Emanuel, and Al Gore often claim that hurricanes are among the extreme weather events that have been exacerbated by man’s selfishness, greed, and refusal to amend his carbon-guzzling lifestyle. But there is “little evidence” that this is so, according to the study’s author Paul Homewood. In summary, [there is] low confidence that any reported long-term (centennial) increases in tropical cyclone activity are robust, after accounting or past changes in observing capabilities. More recent assessments indicate that it is unlikely that annual numbers of tropical storms, hurricanes and major hurricanes counts have increased over the past 100 years in the North Atlantic basin. Evidence, however, is for a virtually certain increase in the frequency and intensity of the strongest tropical cyclones since the 1970s in that region. Unfortunately, a particularly severe hurricane season in the North Atlantic in 2017 gave the alarmists just the excuse they needed to cry wolf once more. Backed by footage of the devastation caused by that year’s two major landfalling hurricanes — Harvey and Irma — they concocted a plausible theory as to why global warming will increase such extreme weather events: hurricanes feed off warm waters, so the warmer the waters, the more intense the hurricane. three Category 5 hurricanes have hit the US mainland: the Labor Day hurricane in 1935, Camille in 1969, and Andrew in 1992. Data provided by HURDAT also shows that recent hurricane activity in the North Atlantic has not been unusual by historical standards. In 2017, there were six major Atlantic hurricanes, but the highest total recorded was eight in 1950. Of last year’s six, two were Category 5 – Irma and Maria – but again, this is not unusual, having occurred five times previously, including in 1932 and 1933. Historical data shows that Atlantic hurricanes, particularly major ones, were much more common between about 1930 and 1960 than in the following three decades. Since 1990, the numbers have returned to the earlier levels. It is widely accepted that this pattern is linked to the Atlantic Multidecadal Oscillation (AMO), a natural reoccurring cycle of temperature changes in the sea surface temperatures. A database of global hurricanes is kept, with data going back to 1970. This shows an increase in the number of major hurricanes and their accumulated energy between 1970 and 1993. This is associated with the AMO cycle too. Since 1993, there has been a decline in the frequency of all hurricanes, major hurricanes and accumulated energy. In summary, there is little evidence that global warming has resulted in more hurricanes, or more intense ones in recent years. On the contrary, available evidence confirms that hurricane and major hurricane frequency has been similar in many prior periods. Hurricane activity, in other words, is a cyclical weather event which has nothing to do with “man-made” climate change. Don’t let the alarmist #fakenews merchants tell you otherwise.